Manmarziyaan (transl. The heart's wish; Hindi pronunciation: [mənməɾzɪjaːn]), released internationally as Husband Material, is an Indian Hindi-language romantic comedy-drama love triangle film directed by Anurag Kashyap and written by Kanika Dhillon. Starring Abhishek Bachchan, Taapsee Pannu and Vicky Kaushal, the film is jointly produced by Phantom Films and Aanand L. Rai's Colour Yellow Productions. Manmarziyaan began filming in February 2018. It is a love story set in Amritsar, Punjab, India. Principal photography wrapped up in April 2018. It premiered at the 2018 Toronto International Film Festival and was released in India on 14 September 2018 to positive reviews from critics. A trailer was released on 9 August 2018. Rumi (Taapsee Pannu), a young woman, is in love with Vicky (Vicky Kaushal), a part-time DJ. One day they are caught by Rumi’s family and pressure builds for them to get married. Rumi promises her family that Vicky will come with his parents to ask for her hand in marriage and if he doesn't show up, she will marry whoever her family chooses. However, nervous and immature, Vicky repeatedly gets cold feet. Eventually, she gives up on him and agrees to an arranged marriage with a mature and responsible banker, Robbie (Abhishek Bachchan).Rumi accepts the proposal but the night before the wedding, refuses to marry, believing Vicky has changed. However, he backs out again. Robbie and Rumi get married the next day. She gradually starts getting comfortable with Robbie. One day, Vicky shows up to tell Robbie about him and Rumi, she tells Robbie that she wants to stay in the marriage. He still reminds her that she has a choice. She ends up sleeping with Vicky the next day. Robbie, suspiciously, follows Rumi and ends up seeing her with Vicky. Robbie, realising that Rumi has cheated on him, gets heartbroken. When confronted, Robbie confesses that he loves Rumi but she and Vicky deserve each other. The next day, Robbie files for an annulment. Rumi realizes that she is in love with Robbie and Vicky was never the "husband material" she was looking for. Initially reluctant, Vicky leaves Rumi. Rumi meets Robbie in court. They sign the papers. On the way, Rumi answers the questions Robbie had asked her. Ultimately, Robbie forgives her and they reconcile. In November 2016, it was announced that Anurag Kashyap will be directing Manmarziyaan, produced by Aanand L. Rai. It was supposed to be directed by Sameer Sharma, who had shot some portions of the film, but Rai was not happy with the rough cut and stopped the shooting. He then approached Ashwiny Iyer Tiwari to direct it, but she could not do it because of her "prior commitments". Initially, it was reported by the media that Dulquer Salmaan, Ayushmann Khurrana and Bhumi Pednekar were cast in the film, but they dropped out of the film. Abhishek Bachchan was then brought in as a replacement for Dulquer Salmaan. Pannu's character in the film is a sports shop owner who has learnt hockey from her parents. In December 2017, it was announced that Abhishek Bachchan will be a part of the film. The main cast also features Masaan star, Vicky Kaushal, who plays an aspiring DJ and is unable to commit to his love. The film has been shot in Punjab, while some portions in Delhi and Kashmir. Manmarziyaan did good business at the box office overall. It had a fair weekend at the box office as it managed to collect ₹4 crore on opening day. The film saw further jump in collections on Sunday as a result of which ₹5.70 crore more came in. The worldwide gross of the movie was ₹40.39 crore. The soundtrack of the film has been composed by Amit Trivedi while the lyrics are written by Shellee except where noted. The first song "F for Fyaar" was released on 10 August 2018. The second song "Daryaa" was released on 11 August 2018. The third song "Grey Walaa Shade" was released on 12 August 2018. The fourth song "Dhyaanchand" was released on 13 August 2018. The fifth song "Chonch Ladhiyaan" was released on 14 August 2018. The sixth song "Hallaa" was released on 15 August 2018. The seventh song "Sacchi Mohabbat" was released on 16 August 2018. The eighth song "Jaisi Teri Marzi" was released on 17 August 2018. The ninth song "Bijlee Giregi" was released on 18 August 2018. The tenth song "Kundali" was released on 23 August 2018. Vipin Nair of The Hindu gave the soundtrack 4/5 stating that though the "repetitiveness gets in the way on more than one occasion, the composer still manages to deliver a supremely engaging soundtrack, with ample help from Shellee and a bunch of incredible musicians." The Times of India based Debarati Sen, in her review, said the lyricist-composer combo ensures that the album "finds a way to your playlist." 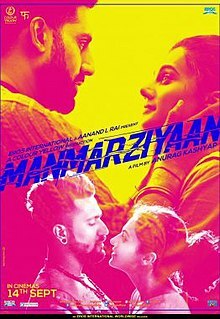 ^ "Manmarziyaan | British Board of Film Classification". www.bbfc.co.uk. Retrieved 1 February 2018. ^ a b Hungama, Bollywood (15 September 2018). "Box Office: Worldwide collections and day wise breakup of Manmarziyaan - Bollywood Hungama". Bollywood Hungama. Retrieved 30 September 2018. ^ Joshi, Namrata (26 July 2018). "Hotel Mumbai to premiere at Toronto International Film Festival". The Hindu. Retrieved 3 September 2018. ^ "Kanika Dhillon: Writing is my creative expression". The Hindu. 25 April 2016. Retrieved 28 February 2018. ^ Lohana, Avinash (8 February 2017). "I Act Only For The Money: Anurag Kashyap". Mumbai Mirror. Retrieved 28 February 2018. ^ "Manmarziyan goes on floors, but where is Abhishek Bachchan?". Deccan Chronicle. 17 February 2018. Retrieved 28 February 2018. ^ a b "Taapsee Pannu's Hockey Training Comes Handy For Manmarziyan". CNN-News18. 21 February 2018. Retrieved 28 February 2018. ^ a b c d Singh, Raghuvendra (13 February 2018). "Taapsee Pannu begins shooting for Manmarziyan". Filmfare. Retrieved 28 February 2018. ^ "Toronto: Timothee Chalamet Starrer 'Beautiful Boy,' Dan Fogelman's 'Life Itself' Among Festival Lineup". The Hollywood Reporter. Retrieved 24 July 2018. ^ Sarkar, Suparno. "Manmarziyan movie review: Critics' verdict and rating of Anurag Kashyap film". International Business Times, India Edition. Retrieved 17 September 2018. ^ Sarkar, Suparno. "Manmarziyan movie review and rating by audience". International Business Times, India Edition. Retrieved 17 September 2018. ^ Sarkar, Suparno. "Manmarziyan box office collection day 3: Anurag Kashyap's movie ends weekend on happy note". International Business Times, India Edition. Retrieved 17 September 2018. ^ "Manmarziyan trailer: Abhishek, Taapsee and Vicky in a complicated love triangle". India Today. ^ "Manmarziyaan (2018) - Cast and Crew". www.moviefone.com. Retrieved 22 October 2018. ^ "Not Dulquer Salmaan, but Abhishek Bachchan in Anurag Kashyap's next". The New Indian Express. 21 January 2018. Retrieved 28 February 2018. ^ "Abhishek Bachchan replaces Dulquer Salmaan, to romance Taapsee Pannu in Manmarziyan?". Deccan Chronicle. 29 December 2017. Retrieved 28 February 2018. ^ "Manmarziyan: Anurag Kashyap's next starring Abhishek Bachchan, Vicky Kaushal, Tapsee Pannu finally goes on floor". Firstpost. 21 January 2018. Retrieved 28 February 2018. ^ "Manmarziyaan - Original Motion Picture Soundtrack". Saavn. ^ "Manmarziyaan song F for Fyaar sings of the magic and perils of love, is perfect for every mood- Entertainment News, Hindustan Times". Hindustan Times. Retrieved 10 August 2018. ^ "Daryaa: New track from 'Manmarziyaan' vies to be your go-to soulful track this season- Entertainment News,DNA". DNA. Retrieved 11 August 2018. ^ "#GreyWalaShadeOUT: लूप में बार-बार सुनेंगे 'मनमर्जियां' का गाना 'ग्रे वाला शेड', पंजाबी स्टाइल में प्यार की खूबसूरत कहानी की है बयां- Entertainment News, Bollywood Life.com". Bollywood Life. Retrieved 12 August 2018. ^ "DhyaanChand track from 'Manmarziyaan' will hit the party goals- Entertainment News, DNA". DNA. Retrieved 13 August 2018. ^ "Manmarziyaan: Chonch Ladhiyaan is a mellow, romantic track sung by Harsheep Kaur, Jazim Sharma- Entertainment News, Firstpost". Firstpost. Retrieved 14 August 2018. ^ "Manmarziyaan: Amit Trivedi creates an atmosphere of impassioned love in new lyrical song 'Hallaa'- Entertainment News, Firstpost". Firstpost. Retrieved 15 August 2018. ^ "Manmarziyaan Song Sacchi Mohabbat: The new track is a conversation between two lovers with peaceful music- Entertainment News, Pinkvilla". Pinkvilla. Retrieved 16 August 2018. ^ "Manmarziyaan: Jaisi Teri Marzi lyrical audio song is out—Watch- Entertainment News, Zee News". Zee News. Retrieved 17 August 2018. ^ "Bijlee Giregi from Manmarziyaan, An Ode to Taapsee Pannu - Entertainment News, Bollywood Helpline.com". Bollywood Helpline.com. Retrieved 18 August 2018. ^ "Kundali from Manmarziyaan - Entertainment News, Eeyuva.com". Eeyuva.com. Retrieved 18 August 2018. ^ Nair, Vipin (18 September 2018). "Whopper of a soundtrack". The Hindu. ISSN 0971-751X. Retrieved 21 September 2018. ^ "Manmarziyaan - Music Review (Bollywood) | Music Aloud". www.musicaloud.com. Retrieved 21 September 2018. ^ "Music review: Manmarziyaan - Times of India". The Times of India. Retrieved 21 September 2018. ^ "Star Screen Awards 2018 complete winners list". Hindustan Times. ^ "Winners of Star Screen Awards 2018". Bollywood Hungama. ^ "Filmfare Awards 2019: Complete List Of Nominations". NDTV. 23 March 2019. Retrieved 23 March 2019. This page was last edited on 25 April 2019, at 00:38 (UTC).